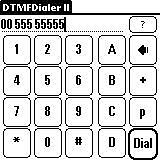 For one of my projects, I needed DTMF tone dialler. I only knew of two, DTMFDA (which doesn't work on the TX) and the DTMFDialer sample which comes with HB++. Since the sample comes with its source code, I modified it to add the features I needed. It supports all 16 DTMF tones (0-9, *, #, A, B, C, D) and the selection of number from the Address book. It also supports pauses (lower case 'p') of 1 second in length. Spaces are automatically converted to pauses when dialling. All other characters in the dial string are ignored. Only the old-style PIM fields are supported. When the application exits, it will not remember the last dialled number. Only devices which utilise the Sound Stream Feature Set can use this application. This means Palm PDA's running OS5. Uses code from the DTMFDialer sample included with HB++ v2.51 by Peter Holmes Consulting.